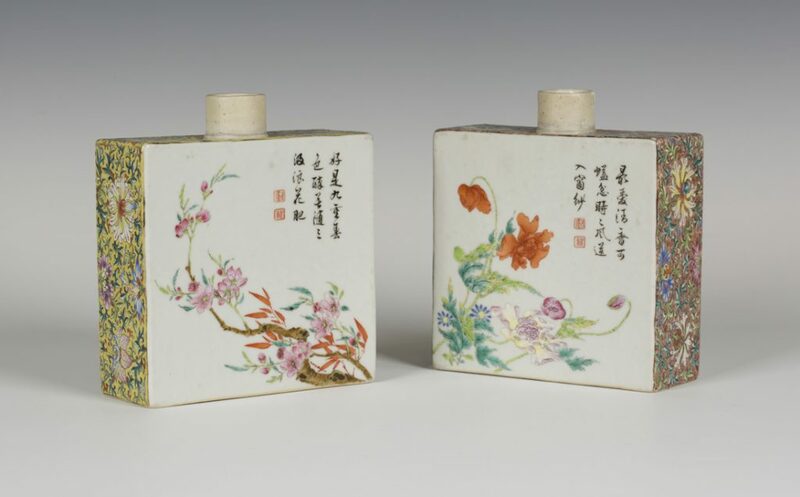 A pair of Chinese famille rose enamelled porcelain tea caddies, displayed on a window sill, caught the eye of a Toovey’s valuer during a routine visit to a client’s home. The caddies were subsequently brought in for sale and went under the gavel in a specialist Asian Art sale on Thursday 23rd February 2017. These Qing dynasty caddies from the Imperial kilns were similar in shape to those made for the European export market. However, the painted blossoming branches and flowering stems accompanied by the lines of text and red seals are typically Chinese in taste, as are the profusely decorated sides with their panels of lotus flowers and tendrils. Measuring just 16.7cm in height they realised a remarkable £132,0000. Both the vendor and Toovey’s Asian Art specialist, Tom Rowsell, are delighted with the result. Readers of this column will know that for many years now I have been promoting and telling the story of Sussex as a centre for art and artist, especially in the the 20th century. So I am excited by the exhibition ‘Sussex Modernism: Retreat and Rebellion’ being shown at Two Temple Place, London WC2R 3BD. This exhibition gives voice to how Sussex found herself at the heart of the Modern British Art Movement and the relationships and events which brought artists to Sussex. This ambitious show is the work and inspiration of Dr Hope Wolf, of Sussex University who has brought together works from the collections of many of our county’s most famous museums and art galleries including Pallant House Gallery, The Ditchling Museum of Art and Craft, Towner, Jerwood and the homes of artists and patrons like Charleston, Farleys Farm and West Dean. For more than a thousand years Sussex has drawn artists to her rolling Downland landscape and exciting coastline. Artists such as J M W Turner and John Constable, William Blake and Samuel Palmer were all inspired by, and worked in, Sussex. The 20th Century saw a revival of this ancient tradition with many of the leading Modern British artists living and working in the county. Familiarity and the passage of years has dulled our sense of how shocking much of this art was to its contemporary audiences in the early 20th century. The contrasting context of the Neo-Gothic architecture and panelled rooms of Two Temple Place helps us to rediscover the impact of this important moment in British Art. The first room gathers you with the work of the Sussex born artist, Eric Gill. In 1907 Gill moved to Ditchling in Sussex. Together with a group of fellow artists he founded and worked within the Guild of St Joseph and St Dominic at Ditchling. These artists lived in community with their wives, children, associates and apprentices. They upheld the principles of the artisan artist in the Arts and Crafts tradition. 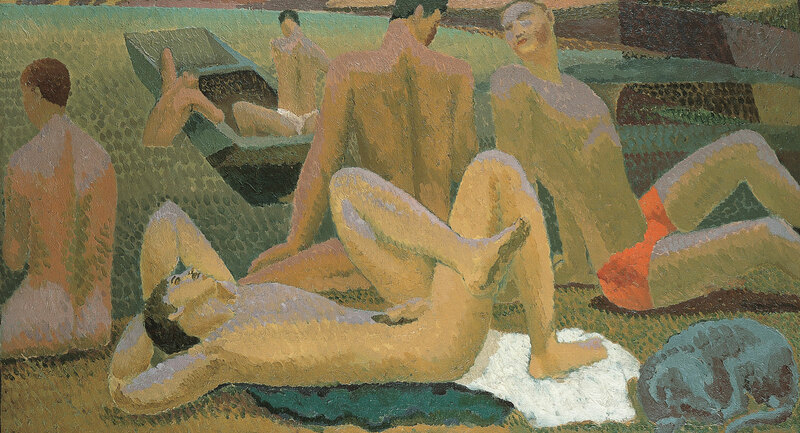 Duncan Grant’s Post-Impressionist ‘Bathers by the Pond’ celebrates the male body and pacifism. 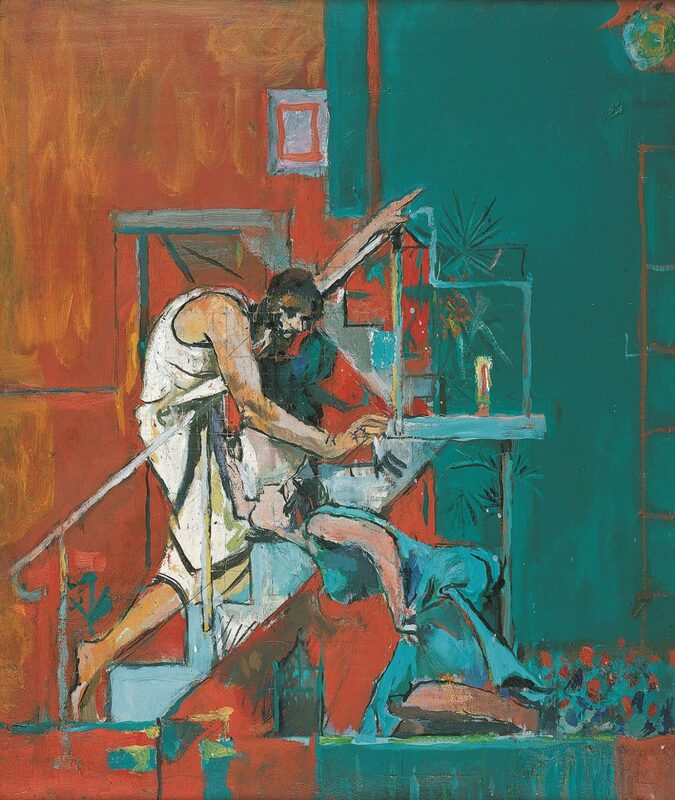 It is one of the works illustrating the influence of Bloomsbury and Charleston House in the show. Many people are surprised to learn that Salvadore Dali worked in Sussex for Edward James at West Dean and that Picasso stayed with his great friend Roland Penrose at Farleys Farm. A joyful Mae West lips sofa, designed by Dali, is on display, one of a number of works illustrating Surrealism in Sussex. The influence of church patrons like The Revd. Walter Hussey, then Dean of Chichester Cathedral, is also explored. 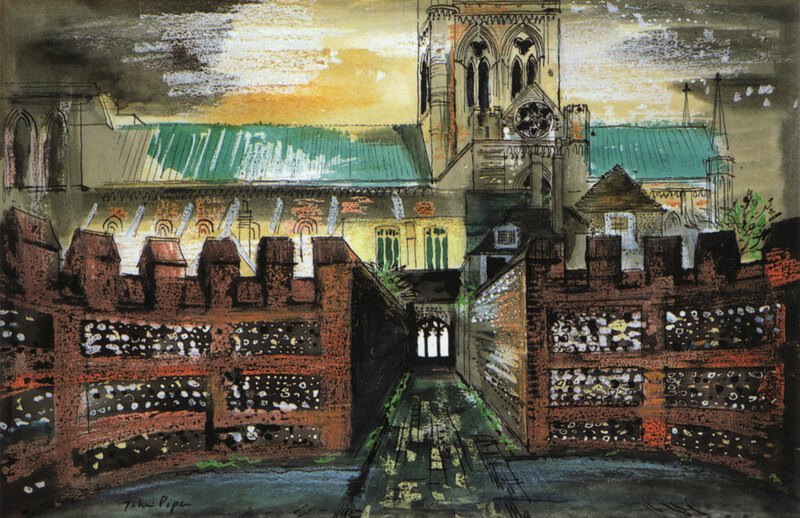 Pieces from his personal collection, now curated by Pallant House, unite the exhibition with the art of Chichester Cathedral and provides one of the best examples of Graham Sutherland’s work, ‘Christ Appearing to Mary Magdalene, Noli Me Tangere’, and a charming view of the Cathedral by John Piper whose Neo-Romantic architectural studies unite him with the British watercolour tradition. The narrative of this exhibition is particularly strong placing the artists and their work in the contexts of their relationships, the times they lived in and Sussex. Dr Hope Wolf acknowledges that there is more to be said but this excellent and timely exhibition should be celebrated. She is deserving of our thanks, as are the Bulldog Trust whose patronage has made this show possible. ‘Sussex Modernism: Retreat and Rebellion’ runs until 23rd April 2017 at Two Temple Place, London, WC2R 3BD and admission is free. For more information go to www.twotempleplace.org. The rise of the sartorial gentleman is arguably still coming to fruition, but the fashion world is already embracing the gentlemanly touches of pocket watches, suit fabrics and perfect tailoring. Something Brighton-based designer, Gresham Blake, has been championing for the last decade. Top fashion houses such as Christian Dior, Chanel and Victoria Beckham have followed, adopting masculine influences in their collections. It is only natural with such a widespread influence on the sartorial world, that it will affect our opinion on interiors too. After all, a sophisticated man needs sophisticated surroundings. Within interiors, it’s a fusion between the traditional and the modern. Dark polished woods and a glow of subtle ambient light juxtaposed with boy’s toys such as sleek wireless speakers and the best of the latest technology. Despite the supposed male influence the look has been adopted by many females, most famously Jennifer Aniston at her Beverly Hills home, as featured in the Architectural Digest a few years ago. If you still can’t picture the look, the QT Sydney hotel in Australia has the luxury and quirky styling that is at the core of the interior design. 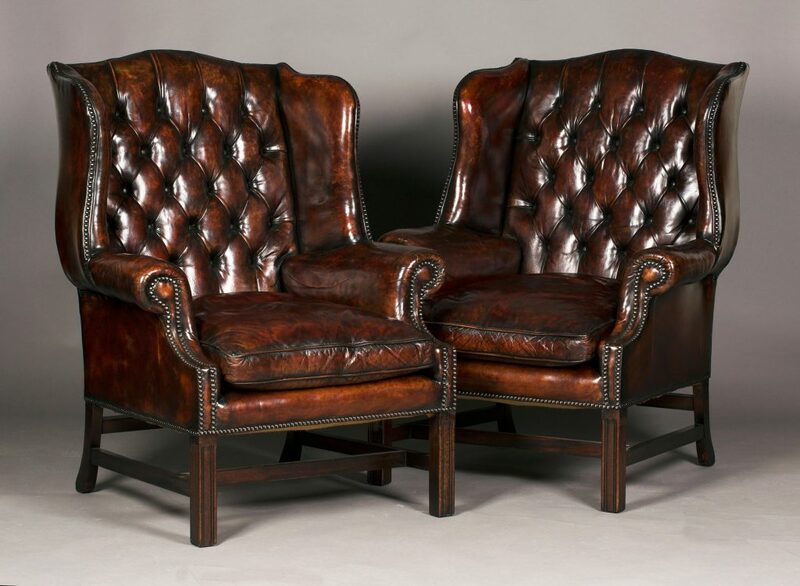 Every month sees a furniture auction at Toovey’s brimming with furniture made from luxurious dark woods and often offers previously loved leather armchairs, as well as other chairs crying out to be reupholstered in a sartorial fabric. 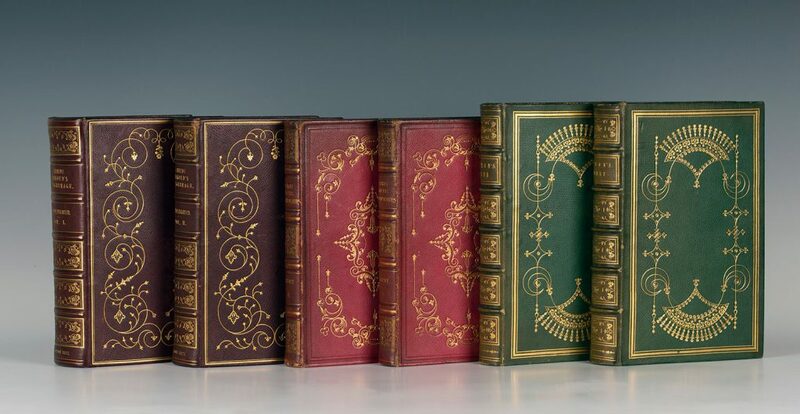 The Specialist Book Auctions always include a host of beautiful books bound in glistening leathers to make a statement on the bookcase of opulence and intelligence. The next Book Auctions at Toovey’s will be on 24th April and 3rd October 2017. Other feature pieces could include decanters, silver salvers and candlesticks, mirrors and statement pieces of art. The look centres around quality, luxury and splashes of colour in a restrained but eclectic style. Toovey’s auctions always have a wealth of quality items that can help achieve the look and perhaps you will be inviting people to view your collection of “mantiques” soon! Visit Toovey’s website to see forthcoming auctions and viewing times. 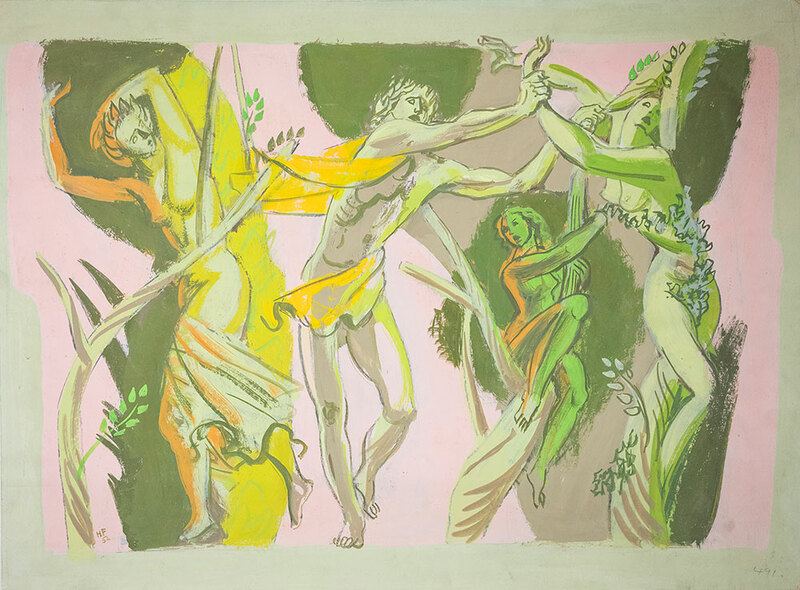 An exhibition of drawings and mural studies by the German émigré artist Hans Feibusch (1898-1998) is currently on show at the Pallant House Gallery in Chichester. Feibusch represents a classical, figurative tradition in 20th century art which has sometimes been overlooked in favour of abstraction and other modern artistic expressions. He also has an important place in the tumultuous history of the 20th century and the revival in church patronage of art in the Modern British Period. The Pallant House Gallery was gifted the entire contents of Feibusch’s North London Studio which included hundreds of drawings, sketchbooks and sculpture in 1997. Hans Feibusch arrived in England in 1933 from Nazi Germany to escape persecution as a Jew. He had become an established painter in Germany, being awarded the German Grand State Prize for Painters in 1930 by the Prussian Academy of Arts in Berlin. His talent was soon recognized in England and he exhibited regularly, often with the London Group, to which he was elected in 1934. The London Group included many of Britain’s leading artists. Kenneth Clark, later Lord Clark, was very influential as director of the National Gallery in London during the war. He introduced Feibusch to George Bell, the then Bishop of Chichester. This resulted in a number of commissions across the diocese. One of Feibusch’s most important works is ‘The ‘Baptism of Christ’ painted in 1951 which can be seen in the baptistery of Chichester Cathedral alongside John Skelton’s font sculpted out of Cornish polyphant stone and bronze in 1982/83. 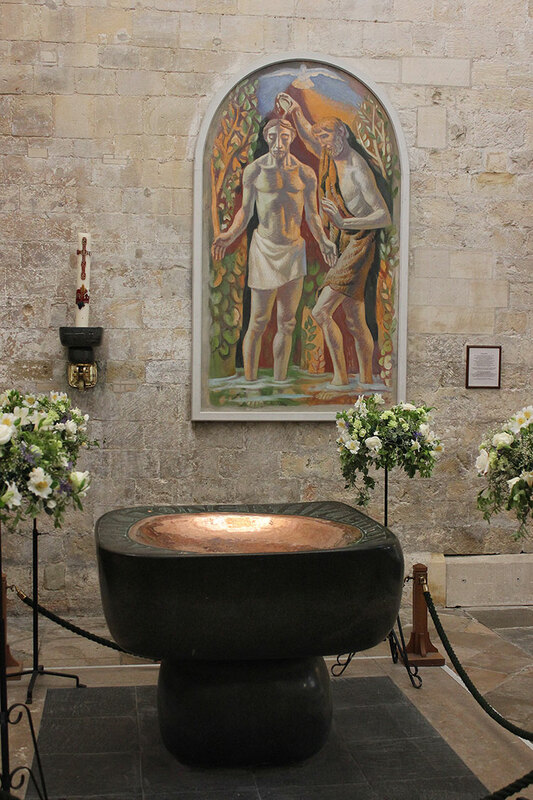 The maquette for the font now holds the paschal candle which represents humanity’s salvation through the passion, death, and Resurrection of Jesus Christ. It can be seen on the wall beside Feibusch’s painting. It is interesting to note that Skelton was a pupil of his Uncle, Eric Gill. Representations of the Baptism of Christ are surprisingly uncommon but there are notable similarities between Feibusch’s depiction and Piero della Francesca’s Renaissance version painted in the 1450s which is now in the National Gallery, London. Whilst the murals deserve to be celebrated it is Feibusch’s sketches and drawings which, for me, reveal his true talent. 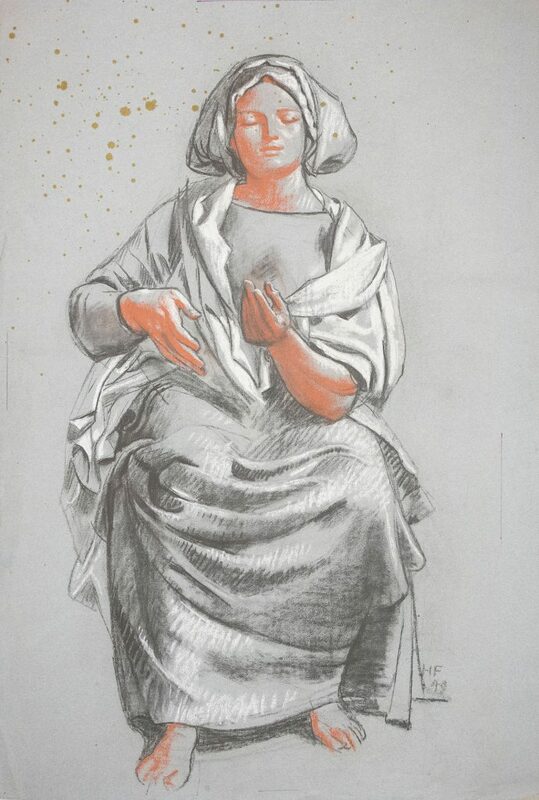 Feibusch’s study in charcoal and crayon of a seated woman owes much to the French Classicism of the 18th century. The study for a mural in pastel depicts the Roman goddess of the hunt, Diana. As she bathes she is attended by nymphs who are shocked when the young hunter Actaeon comes upon them in the forest. The tension in the composition and figures’ faces hints at the tragedy which is to unfold. Actaeon will be transformed into a deer only to be hunted and killed by his own hounds. Hans Feibusch’s figures are convincing, almost sculptural, with a quality of mass and light. His composition and draftsmanship gifts them with a grace and nobility. They represent the work of a gifted artist whose life is inexorably bound up with the extraordinary history and events of his time. Entrance to Chichester Cathedral is free providing the perfect place to pause, reflect and pray amongst its remarkable collection of art. ‘Hans Feibusch: The Unseen Drawings’ runs until the 5th March 2017 and thanks to the generosity of sponsors, DeLonghi, admission to the exhibition is free. And if you go this weekend you will have a last chance to see ‘Idealism & Uncertainty: Classicism in Modern British Art’ which closes on 19th February 2017. Both exhibitions are at Pallant House Gallery, 9 North Pallant, Chichester, PO19 1TJ. For more information go to www.pallant.org.uk. Toovey’s toy valuation event in support of the Horsham Museum & Art Gallery is becoming an annual event. 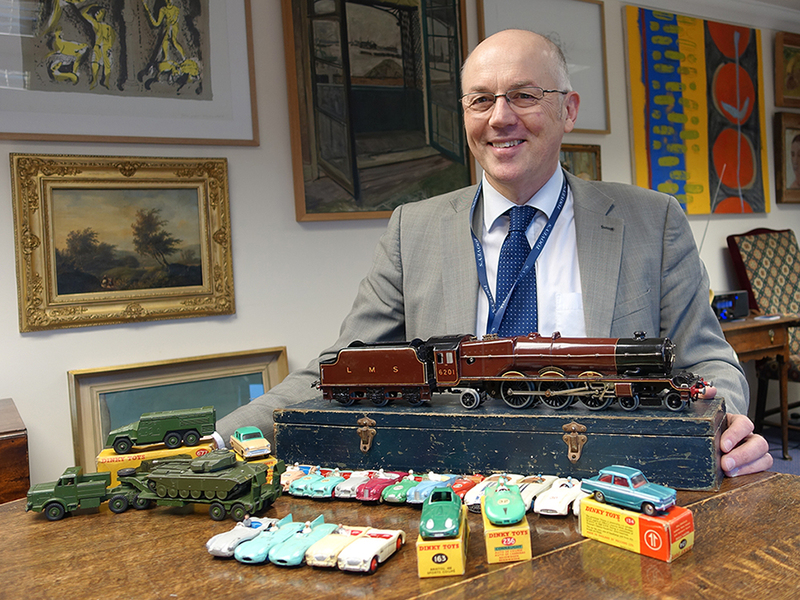 Toovey’s specialist toys valuer, Christopher Gale, will be at the museum on Saturday, 18th February 2017, between 10am and 12noon providing free auction valuations and advice on your toy trains, cars, teddy bears, dolls and collectors’ toys. I ask Chris about his favourite recent discoveries. He shows me a Hornby O Gauge electric train with original box. He says ‘This is one of Hornby’s finest models and reflects the design of the original steam engine. The original Princess Elizabeth locomotive was designed by Mr W. A. Stainer and was built at the Crewe Works in Cheshire. It was one of the first 4-6-2 engines built by The London Midland Scottish Railway (LMSR). The Princess Elizabeth became the most famous of the giant LMSR locomotives when, in 1936, she covered the 401.4 mile run between Glasgow and London at an average speed of 70mph whilst hauling a train. The toy train was produced with the guidance and advice of LMSR.” The model, dating from 1937, looks resplendent in its ‘crimson lake’ livery and the detailing is marvellous. Chris Gales’ enthusiasm is infectious and his knowledge of toys never fails to impress. The toy displays at Horsham Museum are marvellous. Bring your toy trains, cars, teddy bears, dolls and collectors’ toys to see Chris Gale between 10am and 12noon on Saturday, 18th February 2017, for a morning of fun and free pre-sale valuations at the Horsham Museum & Art Gallery, The Causeway, Horsham, RH12 1HE. Toovey’s next specialist toy sale will be held on 21st March 2017. A third of the seller’s commission for items seen at the event and subsequently auctioned by Toovey’s will be donated to the Friends of Horsham Museum. Sellers will receive the full amount they would normally get but they will know that they have helped the Museum as well.